I've made fun of those EXTREEEME '90s advertisements for Image's TMNT Volume 3 series before, but I think this one deserves some bonus chortling. For a smidgen of context, Image's TMNT comic was published at the same time Saban's live-action Ninja Turtles: The Next Mutation series was airing on television. 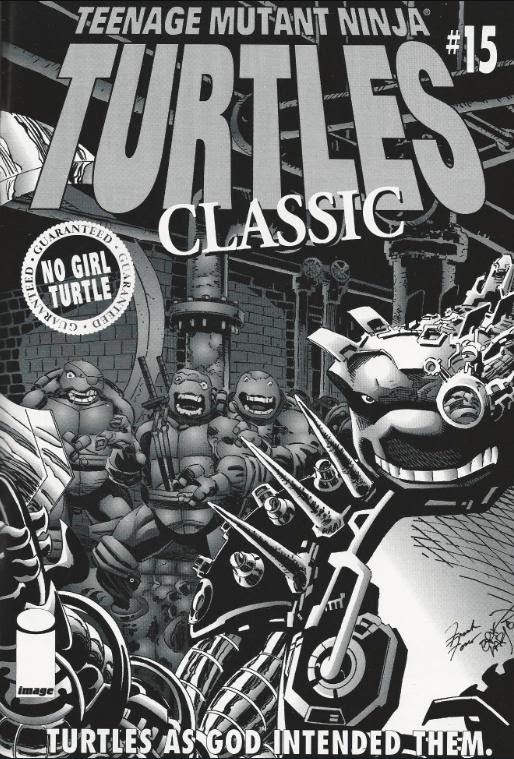 Fans were so appalled by that show's inclusion of Venus de Milo, the female Fifth Turtle, that they wrote in with their concerns about the character potentially appearing in the comic. Every. Single. Month. So as you can see, Larsen was getting a little sick of it. What I find REALLY amusing about this ad, though, is the tagline at the bottom: "Turtles as God intended them". Seeing so bold a statement attached to a piece of art that includes Raphael with an eyepatch and Donatello as a cyborg, made without a shred of irony, just encapsulates '90s comics perfectly for me. Not to mention, Leo lost a hand, too. Weird how Mike is the only Image Turtle that wasn't maimed in some way. Favoritism or maybe Carlson thought, "do I really want to maim the party dude, too?" Or maybe he didn't think about it, as he had enough on his plate. But, I still laugh at that "Turtles as God intended" line. Thank you, Mark, as I needed the laughter refresher. It wonder if it was a coincidence that both series' introduced a villain called "Dragonlord"? No girl turtle, just horribly disfigured versions of your favourite ninja mutants... Just like God intended. Yep. Yeah, the irony in that tagline really is delicious. Erik Larsen was a master at funny advertisements for his Image titles. So many Savage Dragon ads were parodies of other comics' ads (even other Image series).